See Denver Broncos live at Oakland Coliseum! 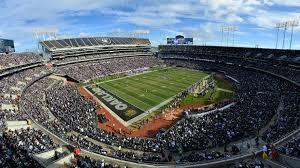 The Oakland'“Alameda County Coliseum, often referred to as the Oakland Coliseum, is a multi-purpose stadium in Oakland, California, which is home to both the Oakland Athletics of Major League Baseball and the Oakland Raiders of the National Football League. It opened in 1966 and is the only remaining stadium in the United States that is shared by professional football and baseball teams, thus it has a variable seating capacity of 47,170 for baseball and 56,057 for football. The Oakland Coliseum features an underground design where the playing surface is actually below ground level. Consequently, fans entering the stadium find themselves walking on to the main concourse of the stadium at the top of the first level of seats. Box office hours are Monday-Friday 12pm-5pm and closed Saturday and Sunday except on game days.